Lee and Mary Weebothee are master Zuni silversmiths and inlay artists from the Zuni Pueblo. Mary unfortunately passed away in 1993. They both made jewelry since the 1940’s and Lee has said that they sold to wonderful traders like C.G. Wallace, R. L. Wallace, Joe Tanner and Dude Kirk. They also sold beautiful jewelry to Don and Nita Hoel over the years. Lee was born in 1929 and Mary in 1933. Lee and Mary married in 1949 and started making jewelry together shortly after. 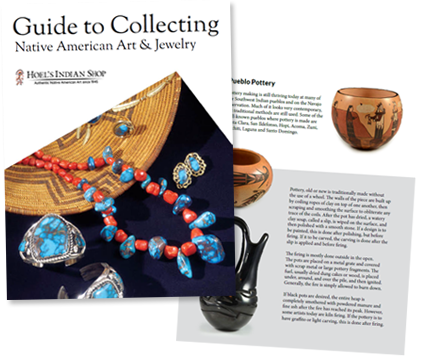 Greg Schaaf stated in his book “American indian Jewelry: 1200 Artist Biographies” that “they were one of the best husband-wife teams in the history of Zuni jewelry”. Lee did most of the silver work while Mary was the stone cutter, which she learned to do from Lee’s mother, Lula. She is known for her master stone cutting skills which are very unusual because of the rounded edges on the stones. They both then set the stones. They are very well know for their interesting cluster work but they also did other types of work using beautiful high quality stones. They have won many awards over the years for their beautiful work.